I actually had the intention to make a sourdough pizza with this topping but didn’t have enough time in the end, so used my tried and tested Italian pizza dough recipe, courtesy of Gennaro Contaldo, Jamie Oliver’s Italian mentor. I also used my go-to simple tomato sauce that I use for everything and my homemade wild garlic pesto. My best tip is to pick lots of wild garlic leaves when in season and blanch some of it, squeeze out the liquid and freeze in little parcels. Perfect to use for pesto or mayonnaise. The all you need is a good buffalo mozzarella, some asparagus, parmesan and olive oil. I promise it’s like tasting spring. Delicious! Mix flour and salt in a mixing bowl. Add the yeast. Add the water bit by bit while stirring with a wooden fork. Knead the dough until elastic. Cut the dough into two and shape to round balls. Put the dough balls back in the mixing bowl, sprinkle with flour and cover. Place somewhere warm and let it rise for 90 minutes. Shape the dough into round pizzas or use a rolling pin to roll it out thinly. Add the toppings you like and bake in 225C, in a low oven, for 8-10 minutes. Fry the garlic in the olive oil in a non-stick saucepan. Add the chopped tomatoes, some water and the tomato paste. Cook for 15 minutes while stirring occasionally, until it has thickened. Season to taste and put aside. Mix wild garlic, almonds, lemon juice and parmesan with a bit of oil to a paste in a food processor or with a stick blender. Keep adding oil until you have the consistency you like. Season to taste with salt and pepper. Keeps in the fridge for 5-7 days. Roll out the dough and drizzle some olive oil on it. Spread out the tomato sauce. Shred the mozzarella into chunks and place on the pizza. Add the asparagus pieces and dollops of wild garlic pesto. Grate over parmesan. Add a little more olive oil and put it in the oven on 225C, middle to low oven for 8-10 minutes. I received evidence from my mother last week that the wild garlic season has started in Sweden, and therefore probably in the UK as well. Hurrah! I love these oniony garlicky green leaves so much, I keep a bundle of blanched ones in the freezer at all times. It feels comforting that I can make wild garlic mayo all year round. Or wild garlic pesto. 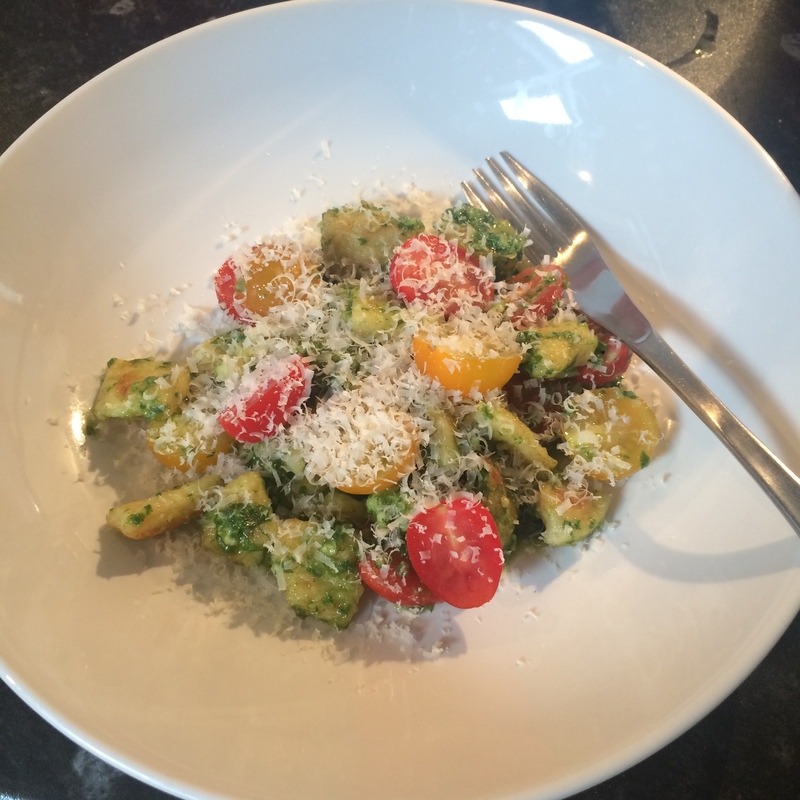 It’s fab with fried gnocchi (it gives them a bit more texture), fresh cherry tomatoes and plenty of grated parmesan. Make the pesto and put it aside. Make the gnocchi and cook them. Then fry in butter until golden. Mix with plenty of the pesto. Cut the cherry the tomatoes in half and mix with the gnocchi. Season to taste. Add olive oil if you want a looser consistency. Top with plenty of grated parmesan. It’s not peak season for wild garlic anymore (sob) but I have been slightly too busy lately to be able to post on the blog regularly. I’m hoping to redeem myself with this delicious (and super easy) recipe and higher posting frequency going forward. If you don’t happen to stumble on some fresh wild garlic in an usually shady part of the woods you can use blanched frozen wild garlic too, or bookmark the recipe for next year. Make the pesto. Boil the new potatoes in salted water. Drain and leave while you fry the asparagus on a griddle pan until semi-soft. Cut each stalk into 3-4 pieces and cut the potatoes into chunks. Toss with pesto in a bowl and season to taste with salt and black pepper. 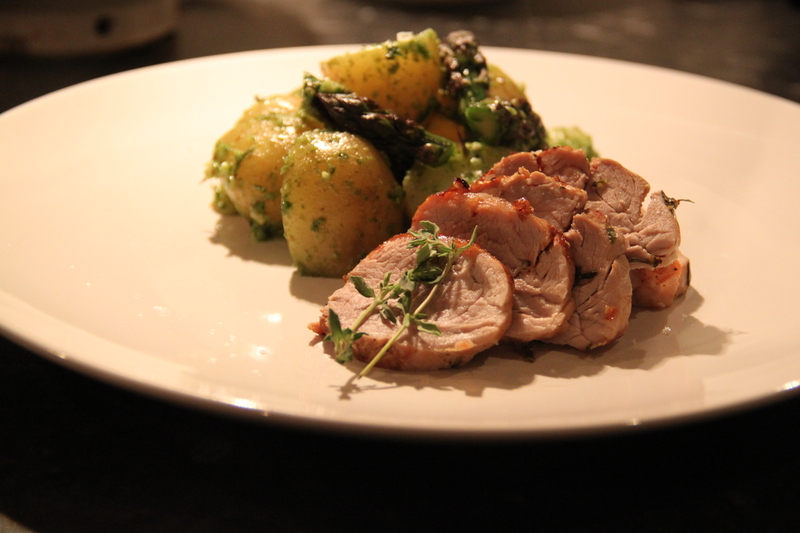 Serve with various barbecued meats or this lovely pork fillet. 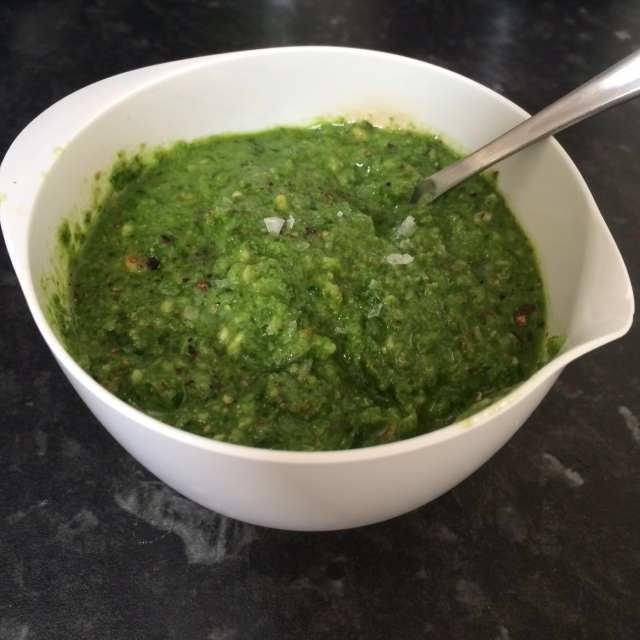 When I was in Sweden last my mother gave me a large bag of wild garlic she picked for me, so back in London I made a batch of lovely pesto that I’ve been eating lately. The same day I made it I just had it with spaghetti and (more) grated parmesan as a light lunch. Delicious! A little while ago when I had invited Jess and Laura over for dinner, I was not my usual organised self. I was battling a cold and only had the energy to clean the flat and prepare dessert the day before, and figured I could buy the rest at lunch time the same day and prepare it before my guests arrived. That day I was particularly busy at work and didn’t have time to go to a nice supermarket. Instead I rushed in to the closest Tesco Express and was devestated when I realised they didn’t even have spinach in the shop, and I had re-plan the whole menu then and there. But it turned out well. 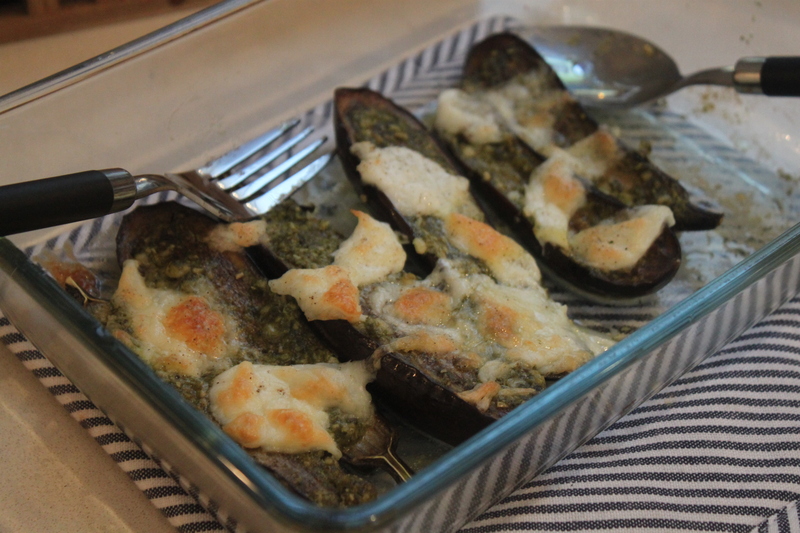 As my starter I served serrano rolls with lemon crème (but made with prosciutto instead) and roasted baby aubergines with pesto and mozzarella, served with crusty bread. Even though this is more to throw ingredients together than actual cooking it was a nice dish, perfect for barbecues or summery buffets. Wash the aubergines and cut in half lenghtways. 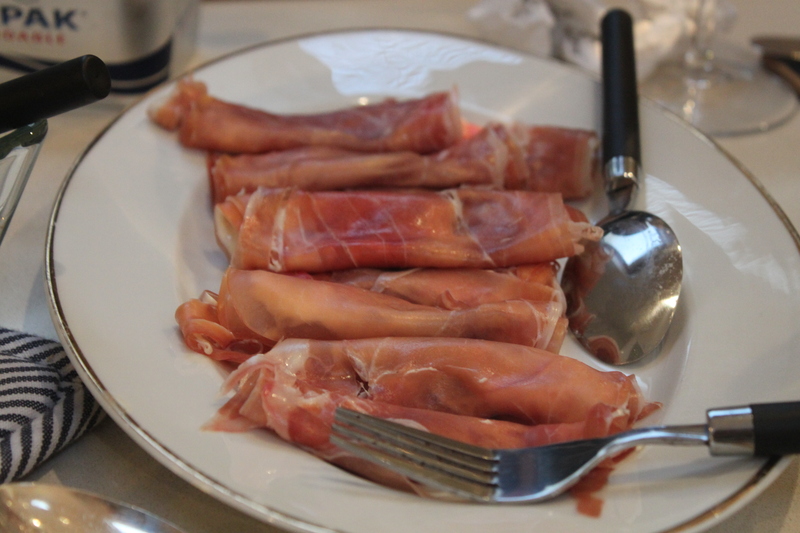 Place skin-side down in a roasting tray and brush the flesh with olive oil. Bake for 20 minutes in 200C oven. 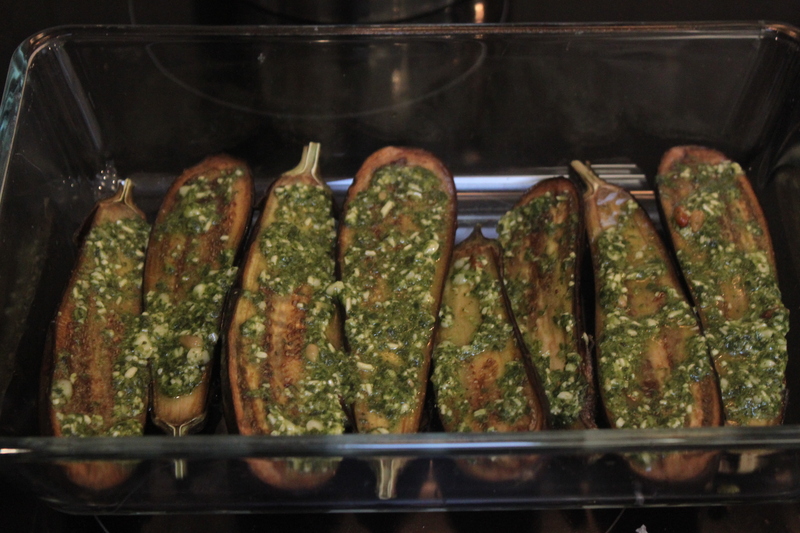 Remove from oven and spread a tsp of pesto on each half. Top with chunks of mozzarella. Season and bake for another 5-10 minutes or until the cheese is golden brown.